When humans first migrated from their origin in east Africa and encountered the sea, they discovered its rich food resources. For much of history since, those living on the coasts around the world have survived primarily on the harvest from the sea. They have fished. 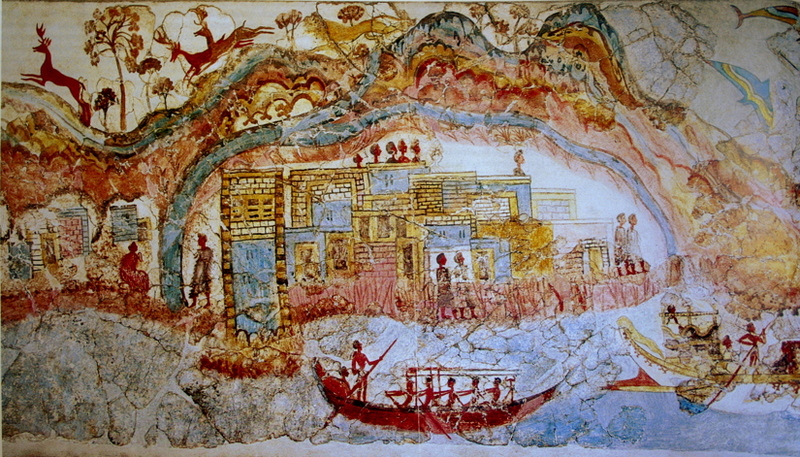 On the island of Thera (Santorini), fishing would have been the primary means of food production, and the flotilla of boats shown in this fresco from over 3,500 years ago would have formed their fishing fleet. In this article and the next, I am going to look at much more recent paintings which show fishing on the coast (rather than out at sea), and how they have been important influences over the development of painting during the nineteenth century, in particular. Before the nineteenth century, fishing on the coast was not a popular theme for painting. Marine specialists much preferred to show warships, often operated by or for their patrons. Like farming, fishing was not the sort of activity whose images graced the walls of the rich and influential. London born and bred, Joseph Mallord William Turner (1775–1851) had little to connect him with coastal fishing apart from his visual imagination. But as he travelled around the British Isles painting topographic views, he must have come across Alum Bay and The Needles, a chain of chalk pinnacles at the western tip of the Isle of Wight. Fishermen at Sea (1796) was the first oil painting which Turner exhibited at the Royal Academy. 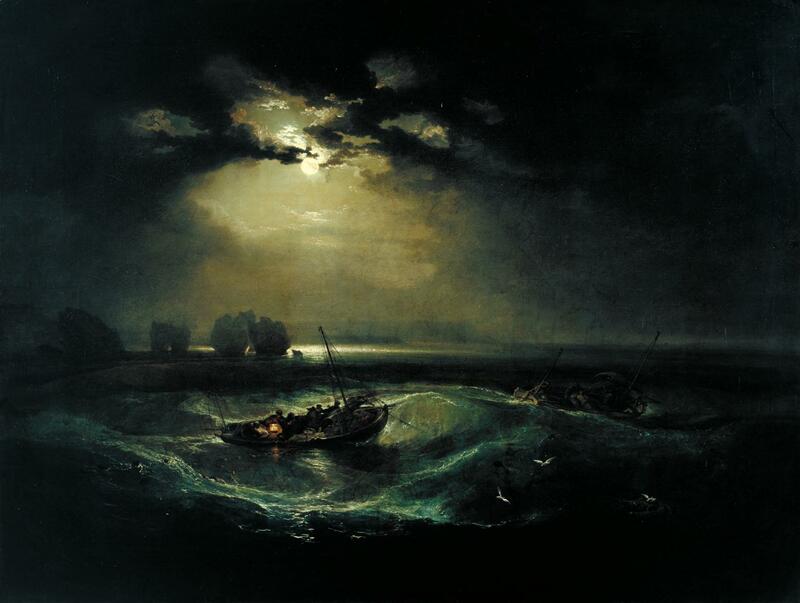 Making this a nocturne, in the vogue established by British painters of the late eighteenth century, heightened its effect; the moonlight and power of nature makes the small boat with its weak lantern appear very feeble and vulnerable. The appearance of The Needles has changed since then, with the collapse of the chalk arch shown by Turner, and the construction of a lighthouse at the end of the rocks. This remains an exciting stretch of water for small boats, and is on the course of one of the world’s largest yacht races, the Round the Island Race. Some years ago my son and I karaked between the chalk pinnacles, an experience known as threading the Needles. Over the next few years, Turner painted more superb and groundbreaking coastal views featuring fishing. 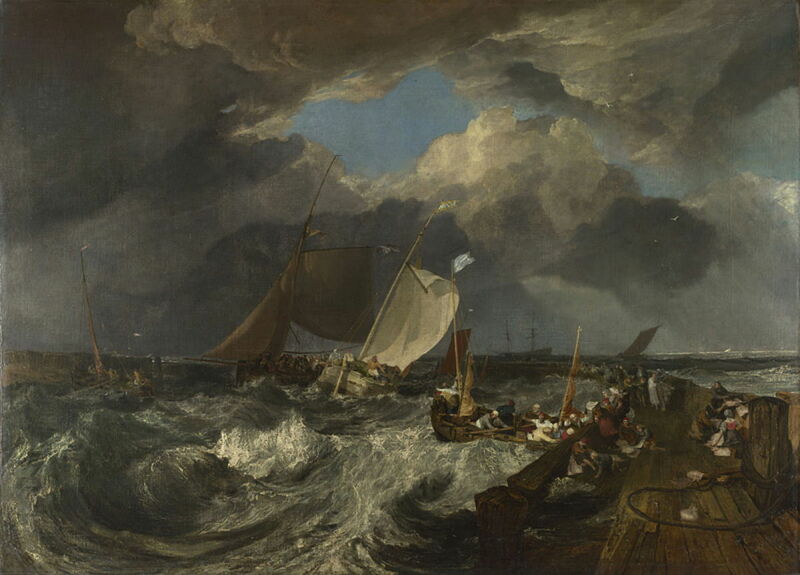 Seapiece with fishing boats off a wooden pier, a gale coming in could have been painted at any of dozens of different locations, and shows three small fishing boats and a larger vessel struggling with a storm. 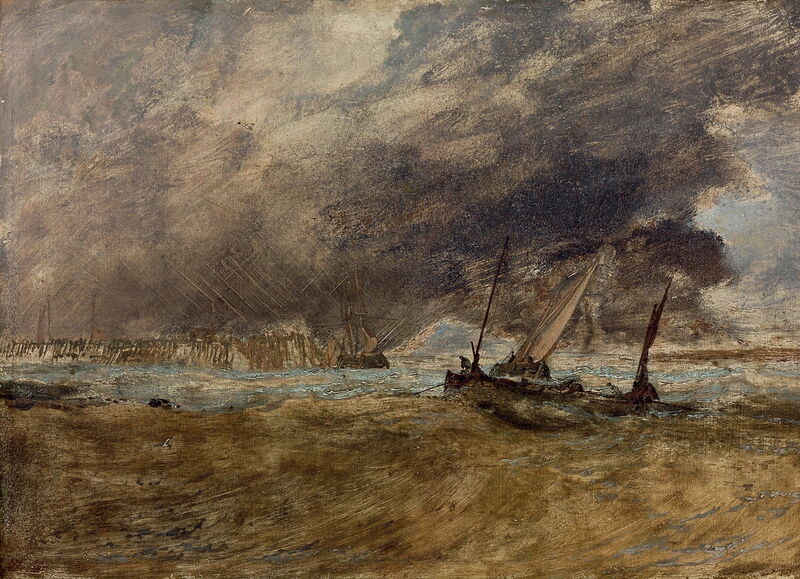 Turner has used sgraffito to score lines into his storm, and impasto for the waves. Joseph Mallord William Turner (1775–1851), Calais Pier, with French Poissards preparing for Sea: an English Packet arriving (1803), oil on canvas, 172 x 240 cm, The National Gallery (Turner Bequest, 1856), London. Image courtesy of and © The National Gallery. In 1802, Turner turned his attentions to the European continent, in the lull between the French Revolution and the Napoleonic Wars. He crossed from Dover to Calais, the shortest route but often a rough one, and caught the sea when it was less comfortable. He painted the scene of his arrival in France in Calais Pier, with French Poissards preparing for Sea: an English Packet arriving (1803), in which the French fishermen seem happy to head out in search of a catch. Although Turner uses the light with great skill, and illuminates the sail of one of the vessels leaving, when shown at the Royal Academy opinion was that the foreground was unfinished, and it was not well received. Turner’s Coast Scene with Fishermen and Boats (c 1806-07) is not a watercolour, neither was it painted late in his career when his work had undergone radical change. It is a sketch, probably showing part of the Thames Estuary (to the east of London), and probably formed the basis for his slightly later Fishing upon the Blythe-Sand (1809). 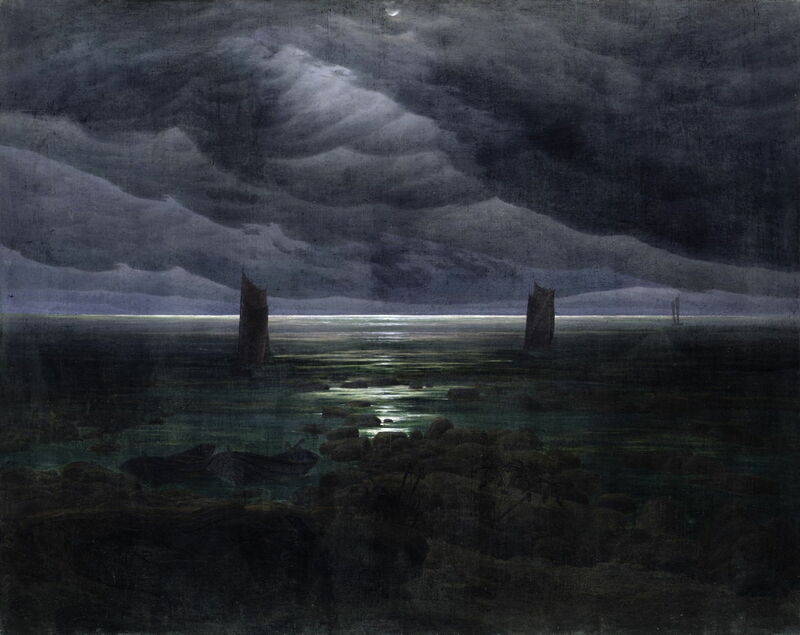 Caspar David Friedrich’s idea of fishing at night, in his Seashore by Moonlight (1835–36), is quite different from Turner’s. The lower half of the canvas is utterly calm and placid, but the oppressive blanket of clouds above gives a profound gloom. Claude Monet (1840–1926), The Mouth of the Seine, Honfleur (1865), oil on canvas, dimensions not known, Norton Simon Museum, Pasadena, CA. Wikimedia Commons. When he was only four years old, Claude Monet’s family moved to the port of Le Havre, on the Channel coast of France, where he later started to paint. 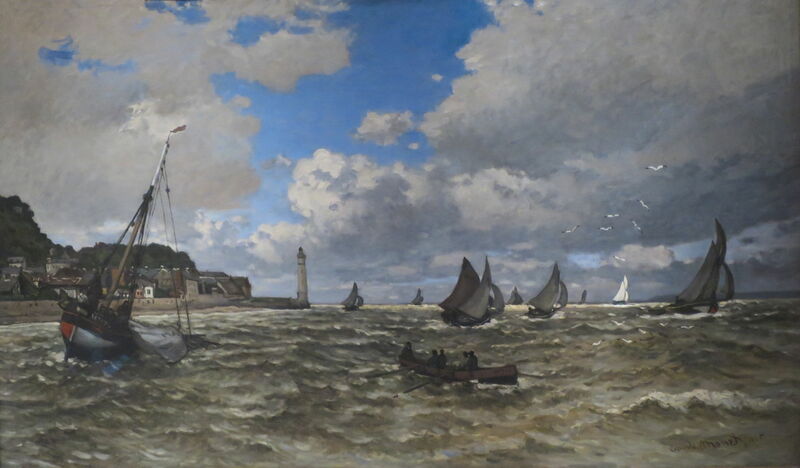 Among his early works were many showing the coast around that area, including The Mouth of the Seine, Honfleur, which was painted in 1865, when he was still a realist. 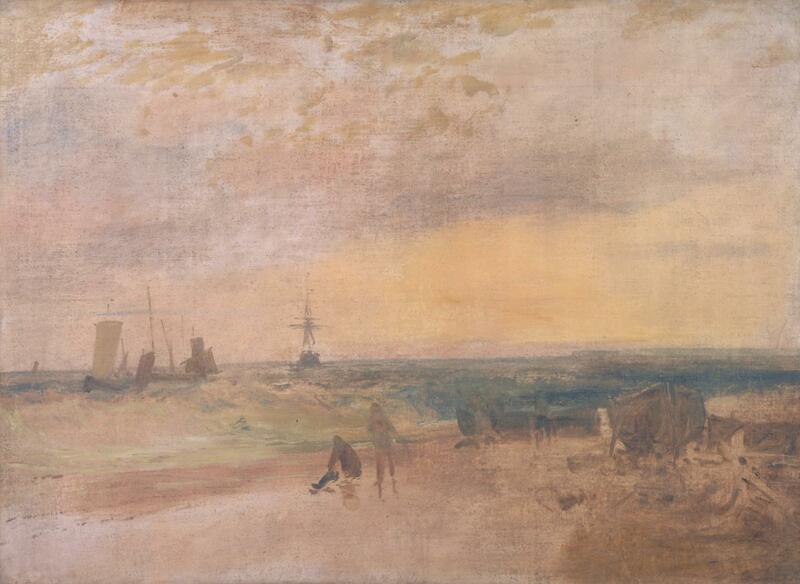 He is extremely unlikely at this stage to have seen Turner’s Calais Pier, but uses a similar shaft of sunlight to bring out the white sails of the boat in the distance. His sea already seems to be getting very painterly, too. 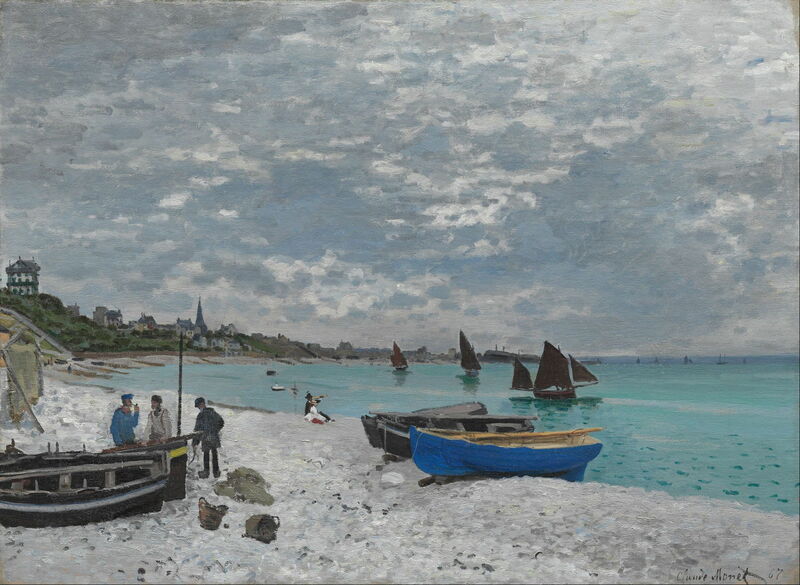 Claude Monet (1840–1926), The Beach at Sainte-Adresse (1867), oil on canvas, 75.8 x 1,025 cm, Institute of Chicago, Chicago, IL. Wikimedia Commons. Just a couple of years later, Monet painted these fishing boats in fairer conditions, on the other side of the mouth of the River Seine, in The Beach at Sainte-Adresse (1867). In much flatter light, and with less breeze, there is less scope for the effects of his earlier work, but the evolution of his style is unmistakable. Seven years after Monet’s painting at Sainte-Adresse, he and others gathered to show their work at the First Impressionist Exhibition in Paris. Among the artists represented there was Ludovic-Napoléon Lepic (1839–1889), a real Viscount at the time, and a good friend of Edgar Degas. Though he was never an Impressionist, Lepic became one of the leading French marine artists of the day. 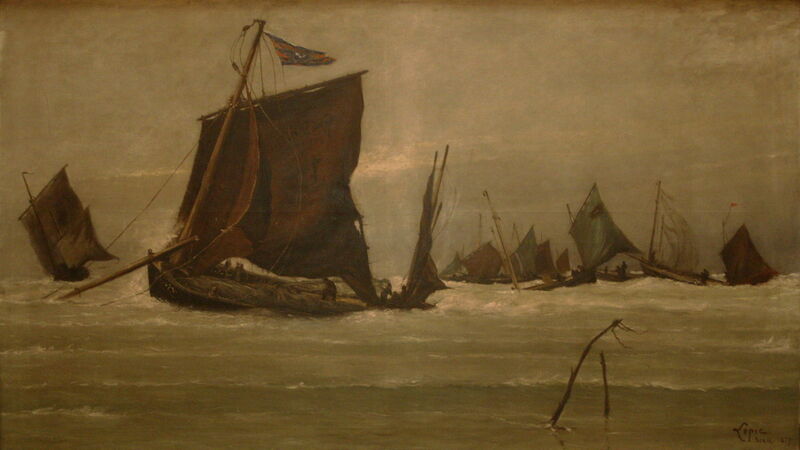 Fishing Boat Entering Berck, painted a couple of years after that exhibition, shows the chaos among and damage to a fleet of small fishing boats as they struggle with heavy seas off the fishing port of Berck, further east along the Channel coast, closer to Turner’s rough landing at Calais. The vessel closest has sheared its bowsprit, is at risk of sinking by the stern, and its sails are ragged. Others also appear in quite serious difficulties. Painting fishing vessels under way on the coast is a challenge in the finest of weather. A succession of superb artists have shown the hazards and difficulties which those fishermen face, in paintings which show their everyday dramas. These are some of the finest paintings of our coasts. In the next article, I will look at the bringing in of the harvest from the sea – a complete contrast, filled with activity and people. Posted in General, Life, Painting and tagged Friedrich, landscape, Lepic, Monet, painting, Turner. Bookmark the permalink.